An essential reference for all Saniwa! It's been one year since our servers went online in 2015. But it couldn't be contained to a PC browser game and smart phone application alone. No, Token Ranbu -ONLINE- went on to inspire musicals, stage performances, comics, two different anime adaptations, and a wide variety of other mixed media. 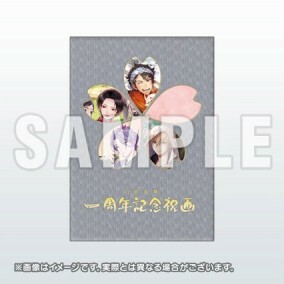 So we're releasing an official book this summer that collects all the illustrations celebrating our first anniversary - the Touken Ranbu 1st Year Anniversary Commemorative Album! In addition to the 28 works unveiled at the "Touken Ranbu - Honmaru Tsushin" Twitter account, the book will include 4 all-new exclusive original illustrations. Just like our Touken Ranbu Kenran Zuroku, this is an essential reference for all true Saniwa. ・This is the same " Touken Ranbu 1st Year Anniversary Commemorative Album" that was included in the "Touken Ranbu: Summer 2016 Comiket Set." "Crest Covered File Folder" is not included. First sold at Comic Market 90 (as part of the Token Ranbu: Summer 2016 Comiket Set).